moxie made: bsf and super glue. This year I have decided to attend BSF. We go on Thursday mornings and so far, it has been great! Crews and Tate will be coming for the first time this week. So, we'll see if I still say it's great after I attempt to get everyone fed and dressed and to Greensboro by 9 a.m. Leaving the house before 10:30 is unheard of around here these days. 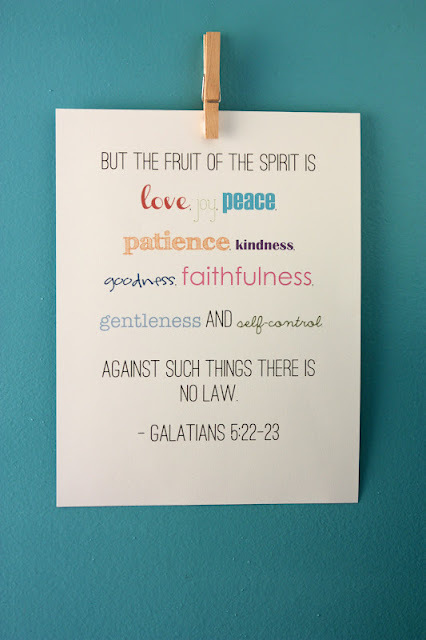 Anyway, at lecture last week, Suzie mentioned Galatians 5:22. The fruits of the Spirit. She said that if we don't already have this verse posted in our home, we should get on it (I'm thinking those weren't her exact words...but close enough :)). It's that important. So, I made a fun little picture and decided I should hang it in my laundry room. I spend enough time in there, I should have something fun and meaningful on the wall! I tried to figure out how I was going to hang it. I knew I didn't want it framed because I wanted a simple look. So, I decided to use a clothespin to hold it (plus I can switch out the verse easily if there's something else I'd like to put there). I honestly considered just super-gluing the clothes pin to the wall....but I didn't (you can stop freaking out now, Jordan). Instead, I found some adhesive putty. The old school teacher kind. It works perfectly! If you'd like a PDF so you can print it out for yourself, just leave me a comment with your email address and I'd be more than happy to email it to you! I love this, Jenny! What a great idea :) I'd love a printable version if you don't mind - carolinemerrill17@gmail.com. Thanks!!! I love this - would like to hang it in my office. My email address is: koporter@mindspring.com. Thanks so much for offering to send the pdf. Thanks for offering this! I want to give one to each of the ladies in my Bible Study. My email is: ckosmon@gmail.com. Kim - I tried to send you an email but received a message that it couldn't go through! Let me know if you have another email address you'd like me to send it to! Love, love, love that we are ALL in BSF together!!! I would love the PDF for your amazingly, crafty fruits of the spirit! What a FABULOUS idea! I love this! I have been a "lurker" of your blog for awhile because I don't think I've ever commented but I'm a regular reader. Your mother-in-law's mom and sister taught me in preschool a LONG time ago ;) And, I bet you know a few of my GSO friends at BSF! (I live in GSO too.) What a small world :) I would love a copy of this - melissablogs at gmail. Thank you! :) Happy Wednesday! Love it! Would love a copy as well.